The Wilson 2000 Trucker CB Antenna is a high quality, well-engineered CB antenna that offers outstanding performance. Wilson antennas have been the preferred name in over the road communications for a generation and are the number one in customer satisfaction antenna available today. The Wilson 2000 is made with high impact (nearly indestructible) Mobay Thermoplastic. Wilson's exclusive design of the low loss coil that floats to eliminate approximately 95% of dielectric loss over the leading competitor's design. Wilson antennas have demonstrated gain performance proven by power gain tests conducted at the Lockheed Corporation Antenna Test Laboratory. Wilson antennas have been shown to have 58% more power gain over K40 brand antennas. Wilson antennas have the highest quality engineering efficiency rating of any antenna on the market. Customers who have tried the Wilson 2000 Trucker antenna claim performance that surpasses many fiberglass top loaded antennas! If you are looking for a new or replacement CB antenna, you should seriously consider the choice of leading professionals in over the road communications, the Wilson 2000 trucker CB antenna. The Wilson 2000 trucker CB antenna is a fully compatible with 3/8x24 threaded mounts and accessories. Also available with 5 or 10 inch shaft & Black, or White colored center load coil. 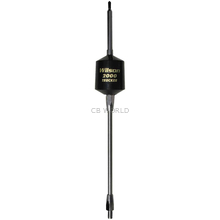 CB World recommends the installation of an antenna spring anytime that there is a chance of impact occurring between the antenna and any other solid object such as a low garage door opening, tree limb, overpass, etc. A heavy duty spring would be an appropriate choice for use with the Wilson 2000T antenna. Selecting the right antenna spring is made easier with the guide to choosing antenna springs available in the CB World Help Center. High quality RG58 coax for single antenna installation and high quality RG59 coax for co-phased antennas is recommended for use with the Wilson 2000 Trucker antenna. 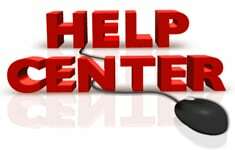 CB World's help center has a complete step by step guide to setting the SWR on your Wilson antenna.